It’s been a good week of banging nails. Mo Betta Bangin’ from Ned Warner on Vimeo. This is conventional framing, that is without much in the way of blueprints. And since we altered the basic floor plan, it does lead to unintended consequences. An alteration on the first floor ends up hitting you in the face on the third floor. We are using no manufactured trusses, so the roof is measured and cut on site, piece by piece, which necessitates knowledgeable framers. We have them, but there are always several ways of getting the job done, so opinions vary and discussions ensue. I can listen to two guys on site talk about a framing issue and marvel that although they use English and understand each other, I am at an almost complete loss. It does remind me how much of a visual thinker I am and my need to “see it” to aid comprehension. The third floor is framed in along with three dormers…”dustpan” dormers as one of the carpenters said. The flat roof of this shed dormer may resemble a dustpan, it’s been hard to find any etymological history on the term, but I am fascinated by words specific to a profession. Having been in two other professions (television news and kitchens), terminology specific to each sometimes was completely foreign to those not in the business. The worlds of home building and architecture, have some distinct jargon. 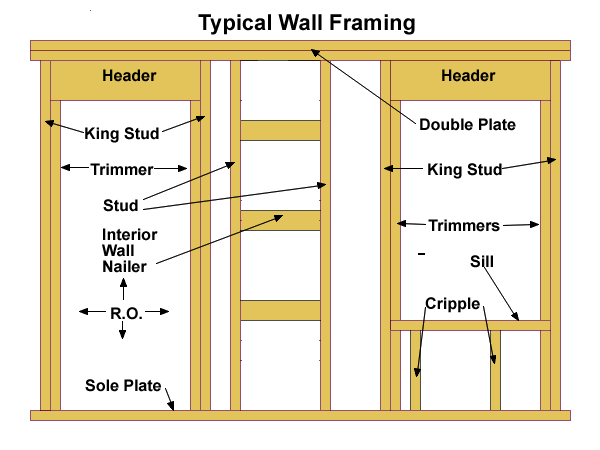 In carpentry, a “jack stud” or “trimmer” refers to a stud holding up a “header”, which is a beam running horizontally above a window or door to transfer the weight above it. “King rafter” (not sure), “king stud”(immediately outside a “jack”, and “cripple” which is a smaller, vertical stud under a window sill. 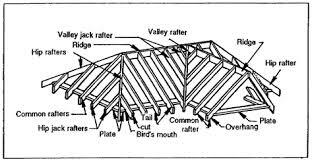 “Birdmouth” or “crowsmouth” refers to a diagonal cut in a rafter that lets it rest on the “top plate”, which is the horizontal length of wood on top of a wall. 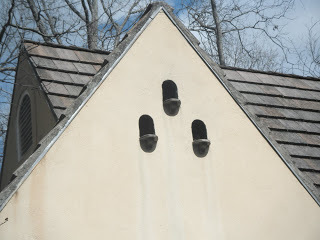 I wonder if that is related to “dovecote”- a shelter, sometimes built on the gable end or eaves, for birds or pigeons? “Cats paw”, “plumb bob”, “crown”, “scissor truss”, the list goes on, identifying tools or procedures specific to a profession, enabling workers to communicate in a shorthand. Not surprisingly, some words are common to both architecture and carpentry, they are after all intricately linked together. So excuse me while I go cut some cripples. This entry was posted in Building a Home, Uncategorized and tagged carpentry, home building, jargon on July 25, 2015 by smedleyman.